The MU College of Veterinary Medicine awarded more than $360,000 in scholarships on May 8 during the 2018 Honors Banquet. The amount awarded for scholastic achievement, clinical proficiency, community service and leadership represented a new record for the college. 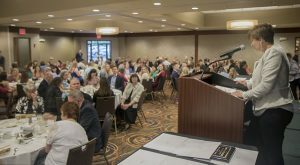 The banquet, held at the Courtyard by Marriott in Columbia, Missouri, featured the presentation of more than 70 scholarships, including five new awards. Presentations were made to veterinary medical students, faculty members, house officers and a veterinary technician. CVM Associate Dean for Student Affairs Angela Tennison welcomes guests to the CVM Honors Banquet. The Harrison-Kaplan Online Graduate Teaching Award was presented to Associate Professor Tim Evans, DVM, PhD, for excellence in online graduate student engagement, course development and course management and delivery. 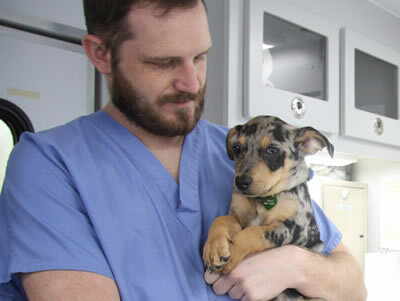 Evans is a toxicologist with the Veterinary Medical Diagnostic Laboratory. The Harrison-Kaplan Online Undergraduate Teaching Award was presented to Associate Teaching Professor of Equine Surgery Joanne Kramer, DVM, for excellence in online undergraduate student engagement, course development and course management and delivery. Alison LaCarrubba (center) was the recipient of the Zoetis Distinguished Veterinary Teacher Award. She is pictured with Nathan Voris of Zoetis and CVM Dean Carolyn Henry. Students in each academic class selected an outstanding teacher to receive a 2018 Golden Aesculapius Teaching Award. Winners were Brian Frappier, DVM, PhD, associate clinical professor of microanatomy, honored by the Class of 2021; Chuck Wiedmeyer, DVM, PhD, associate professor of clinical pathology, honored by the Class of 2020; Kathryn O’Brien, DVM, clinical instructor in small animal emergency and critical care, honored by the Class of 2019; and Jeffrey Bryan, DVM, MS, PhD, professor of oncology, who was chosen by the graduating class. The Golden Aesculapius were Frappier and O’Brien’s second awards of the night. Frappier was selected by first- and second-year veterinary students to receive the Student Chapter of the American Veterinary Medical Association (SAVMA) Teaching Award for Basic Sciences. The students select a faculty member who has made immense contributions to their education and progression through the veterinary curriculum. O’Brien received the SAVMA Teaching Award for Clinical Sciences. 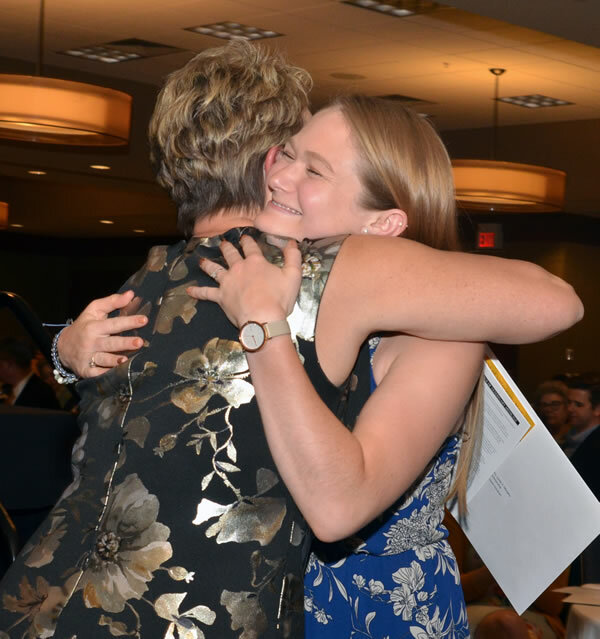 The third- and fourth-year students select the recipient based on dedication to student education, progression toward clinical competency and development of professional abilities. 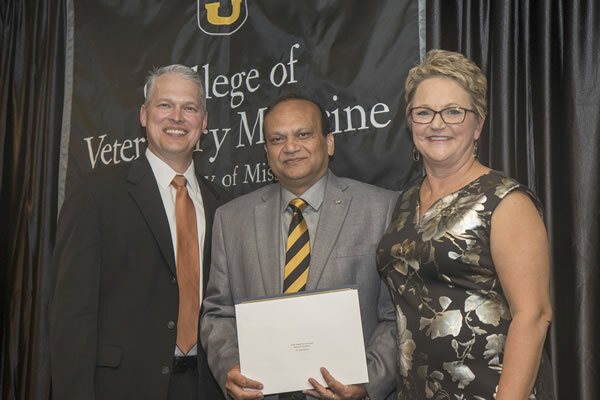 Rajiv Mohan (center) received the 2018 Zoetis Award for Veterinary Research Excellence. He is pictured with Nathan Voris of Zoetis and CVM Dean Carolyn Henry. The graduating class also honored a veterinary technician who had an impact on their clinical experience. Morgan Keys, RVT, supervisor in the Small Animal Emergency and Critical Care Service, received this year’s honor. The Dadd Award honors excellence in veterinary medicine teaching as judged by peers. The 2018 recipient was Professor of Ophthalmology Elizabeth Giuliano, DVM, MS. Faculty members also nominate the recipient of the Zoetis Award for Veterinary Research Excellence, which is presented to a faculty member or graduate student whose research related to veterinary medicine has promise of national recognition. 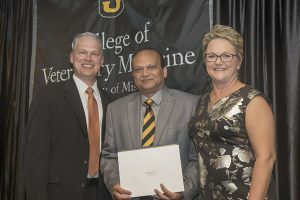 This year’s winner was Rajiv Mohan, PhD, the Ruth M. Kraeuchi Endowed Professor in Veterinary Ophthalmology. Mohan previously received the Zoetis Research Award in 2014. CVM Dean Carolyn Henry congratulates Devin Gardner, recipient of the Dr. and Mrs. Leslie C. Murphy Scholarship, awarded to the graduating student with the highest scholastic average for the entire professional curriculum. Zoetis also supports the Zoetis Distinguished Veterinary Teacher Award. The student body selects an outstanding teacher who, through ability, dedication, character and leadership, contributes to the advancement of the profession as the recipient of the profession. 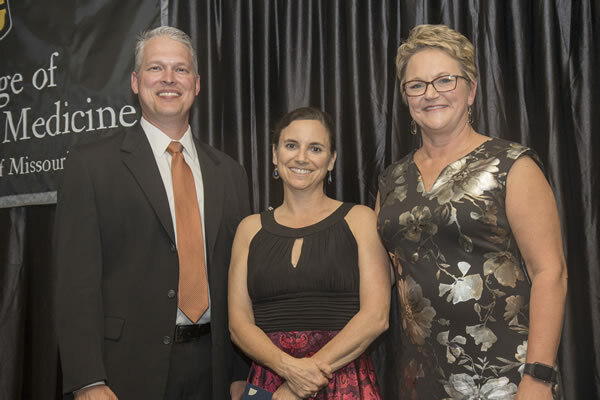 The 2018 award was presented to Associate Teaching Professor of Equine Ambulatory Medicine Alison LaCarrubba. Some awards were presented prior to and following the banquet. A complete list of awards and recipients can be found here.